Special Dances: ⋅ Portland Megaband Benefit Contra Dance, 2nd Saturday in March. ⋅ Portland English Country Ball in November. ⋅ New Year’s Contra Dance. Dance Weekends: ⋅ Portland Raindance, our spring in-town dance weekend, the last weekend in April. ⋅ Northwest Passage, the Labor Day Dance Camp. 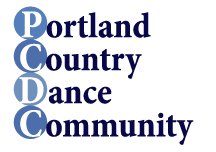 PCDC Grants: ⋅ PCDC Grants Fund – to help PCDC members attend dance and music camps and workshops. Please be aware of our Safe Dancing Policy. A more complete description of PCDC can be found in the PCDC bylaws. Financials are available by request and a summary P&L will be found in the Sept-Oct newsletter for that year.